Our range of products includes Ampoule Washing Machine such as Automatic Rotary Ampoule Washing Machine and Multijet Ampoule Washing Machine. We are among the acclaimed names in the industry for manufacturing and supplying Multi Jet Ampoule Washing Machine. The offered machine is made from high-grade materials sourced from a reliable vendor base and it has high tensile strength. This machine is used in pharmaceutical industry for washing ampoules and vials and provides ultimate solutions for hygiene. Production Rate 30 to 110 Vials/Min. We are among the celebrated names in the industry for manufacturing and exporting Automatic Rotary Ampoule Washing Machine. The offered machine is operated automatically and is used for the washing of ampoules prior to filling in pharmaceutical industries. This machine is meant to eliminate the hassle of manual work and offers hassle free operations over a long period of time. Rotary Ampoule Washing Machine is specially designed to wash Ampoule with minimum contact of machine parts with Ampoules. Machine with specially designed Gripper system holds the Ampoule from Neck and invert the Ampoule till the washing operation completed and again after washing release the Ampoule on outfeed feedworm system in vertical position ensures positive wash of Ampoules. Machine is suitable to wash 1ml to 10 ml Ampoules with the help of change parts, Ampoule feeds through feedworm to infeed Star Wheel and specially designed Gripper hold the Ampoule from neck and invert the Ampoule and move it further on rotary moving system for washing process. We are a trusted name in the industry for manufacturing and exporting Compact Ampoule Washing Machine. 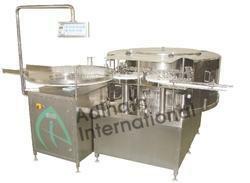 The offered machine is extensively demanded in the pharmaceutical industry for washing ampoules. This machine provides an effective washing solution and is known for its high speed. It is compact in size, durable, user-friendly and requires low maintenance. 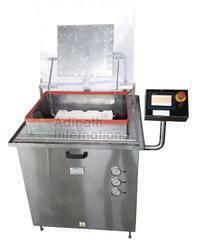 Lab Scale Ampoule Washing Machine is most popular washing machine for the washing of ampoule & vials. Machine is having all operation automatic except loading & unloading of ampoules/vials. Machine is most economical equipment for the washing of inject-able glass containers. Automatic External Ampoule Washing Machine is designed to wash the outer surface of Ampoules. Machine washes the outer sides of Ampoules and eliminates the particles that are formed on the ampoules, which are previously filled and sealed. Net Weight 650 kgs. approx. Gross Weight 950 kgs. approx. R&D Ampoule Washing Machine is most popular washing machine for the washing of ampoule & vials. Machine is having all operation automatic except loading & unloading of ampoules/vials. Machine is most economical equipment for the washing of inject-able glass containers. The dump loading procedure may be used, if ampoules/vials are received in ready to dump boxes, which will have exactly into the same number of ampoule/vial and the pitch, as loading tray. Alternatively, each ampoule/vial has to be arranged into the tray. The loading tray/s is placed directly into the machine & the handle bar is lowered for ampoule/vial for automatic centering of washing needles into the ampoule/vial mouths. The top cover is also lowered & switch is operated for automatic sequential washing both from inside and outside of each individual ampoule/vial. Machine automatically stops after one complete cycle & for removal of tray, reverse procedure is to be observed. Depending on loading & operator’s efficiency one can achieve 30 loading trays in an hour. Pharmaceutical Ampoule Washing Machine is specially designed to wash Ampoule with minimum contact of machine parts with Ampoules. Machine with specially designed Gripper system holds the Ampoule from Neck and invert the Ampoule till the washing operation completed and again after washing release the Ampoule on outfeed feedworm system in vertical position ensures positive wash of Ampoules. Machine is suitable to wash 1ml to 10 ml Ampoules with the help of change parts, Ampoule feeds through feedworm to infeed Star Wheel and specially designed Gripper hold the Ampoule from neck and invert the Ampoule and move it further on rotary moving system for washing process. Automatic Ampoule Vial Washing Machine is specially designed to wash Ampoule with minimum contact of machine parts with Ampoules. Machine with specially designed Gripper system holds the Ampoule from Neck and invert the Ampoule till the washing operation completed and again after washing release the Ampoule on outfeed feedworm system in vertical position ensures positive wash of Ampoules. Machine is suitable to wash 1ml to 10 ml Ampoules with the help of change parts, Ampoule feeds through feedworm to infeed Star Wheel and specially designed Gripper hold the Ampoule from neck and invert the Ampoule and move it further on rotary moving system for washing process. Ampoule Washing Machine is specially designed to wash Ampoule with minimum contact of machine parts with Ampoules. Machine with specially designed Gripper system holds the Ampoule from Neck and invert the Ampoule till the washing operation completed and again after washing release the Ampoule on outfeed feedworm system in vertical position ensures positive wash of Ampoules. Machine is suitable to wash 1ml to 10 ml Ampoules with the help of change parts, Ampoule feeds through feedworm to infeed Star Wheel and specially designed Gripper hold the Ampoule from neck and invert the Ampoule and move it further on rotary moving system for washing process. Ampoule Filling Washing Machine is specially designed to wash Ampoule with minimum contact of machine parts with Ampoules. Machine with specially designed Gripper system holds the Ampoule from Neck and invert the Ampoule till the washing operation completed and again after washing release the Ampoule on outfeed feedworm system in vertical position ensures positive wash of Ampoules. Machine is suitable to wash 1ml to 10 ml Ampoules with the help of change parts, Ampoule feeds through feedworm to infeed Star Wheel and specially designed Gripper hold the Ampoule from neck and invert the Ampoule and move it further on rotary moving system for washing process. High Speed Ampoule Washing Machine is specially designed to wash Ampoule & Vial with minimum contact of machine parts with container. Machine with specially designed Gripper system holds the container from Neck and invert till the washing operation completed and again after washing release the container on outfeed feedworm system in vertical position ensures positive wash of containers. 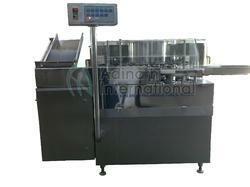 Machine is suitable to wash various sizes of containers with the help of change parts. Automatic Rotary Ampoule & Vial Washing Machine is widely uses in Pharmaceutical, Veterinary & Biotech industry for performance & cGMP demanding customers. Automatic Ampoule Washer is specially designed to wash Ampoule with minimum contact of machine parts with Ampoules. Machine with specially designed Gripper system holds the Ampoule from Neck and invert the Ampoule till the washing operation completed and again after washing release the Ampoule on outfeed feedworm system in vertical position ensures positive wash of Ampoules. Machine is suitable to wash 1ml to 10 ml Ampoules with the help of change parts, Ampoule feeds through feedworm to infeed Star Wheel and specially designed Gripper hold the Ampoule from neck and invert the Ampoule and move it further on rotary moving system for washing process. Glass Ampoule Washer is specially designed to wash Ampoule with minimum contact of machine parts with Ampoules. Machine with specially designed Gripper system holds the Ampoule from Neck and invert the Ampoule till the washing operation completed and again after washing release the Ampoule on outfeed feedworm system in vertical position ensures positive wash of Ampoules. Machine is suitable to wash 1ml to 10 ml Ampoules with the help of change parts, Ampoule feeds through feedworm to infeed Star Wheel and specially designed Gripper hold the Ampoule from neck and invert the Ampoule and move it further on rotary moving system for washing process. Glass Ampoule Washing Machine is specially designed to wash Ampoule with minimum contact of machine parts with Ampoules. Machine with specially designed Gripper system holds the Ampoule from Neck and invert the Ampoule till the washing operation completed and again after washing release the Ampoule on outfeed feedworm system in vertical position ensures positive wash of Ampoules. Machine is suitable to wash 1ml to 10 ml Ampoules with the help of change parts, Ampoule feeds through feedworm to infeed Star Wheel and specially designed Gripper hold the Ampoule from neck and invert the Ampoule and move it further on rotary moving system for washing process. Automatic Glass Ampoule Washing Machine is specially designed to wash Ampoule with minimum contact of machine parts with Ampoules. Machine with specially designed Gripper system holds the Ampoule from Neck and invert the Ampoule till the washing operation completed and again after washing release the Ampoule on outfeed feedworm system in vertical position ensures positive wash of Ampoules. Machine is suitable to wash 1ml to 10 ml Ampoules with the help of change parts, Ampoule feeds through feedworm to infeed Star Wheel and specially designed Gripper hold the Ampoule from neck and invert the Ampoule and move it further on rotary moving system for washing process. We are among the topmost manufacturers, suppliers and exporters of best quality Semi Automatic Multijet Ampoule Washing Machine. Owing to their semi-automated operations and minimum maintenance, these ampoule washing machines are highly demanded. By using advanced machinery, our professionals manufacture these machines in adherence to the industry set norms and regulations.